In the opening moments of District 9, an enormous alien spacecraft hovers above a populated city. Now, I know what you’re thinking: I’ve seen this movie before. For the first sixty seconds, I thought the same thing. I applaud writer/director Neill Blomkamp for taking a tired premise and delivering something new. The aliens aren’t out to get us like in War of the Worlds or Independence Day, nor have they come to help us like in Close Encounters of the Third Kind or Contact. They’re just stuck on Earth, and they don’t like it any more than we do. Twenty years ago, a giant alien mothership ran out of fuel and has hovered over the city of Johannesburg, South Africa ever since. Humans quickly removed the aliens from their ship and forced them to live in the slums of District 9, a run-down camp of government-subsidized housing. Nicknamed “Prawns” because of their appearance, the aliens are essentially prisoners in a world that doesn’t want them. Wikus Van De Merwe (Sharlto Copley) heads up the effort to evict the aliens from their homes and move them to District 10, but after an accident occurs with unexpected side effects, Van De Merwe suddenly becomes the aliens’ strongest ally. District 9 feels fresh on so many levels. It uses a documentary-style approach and was shot almost exclusively with hand-held cameras. The cast doesn’t have any big names, which adds believability to the documentary style, but all the actors are fantastic. Sharlto Copley gives a strong character arc to Wikus Van De Merwe; he starts off being ignorantly optimistic about alien/human relations, then becomes concerned only with self-preservation, and finally comes to treat the aliens as equals. It’s a good character journey, and the motivations behind it are fascinating; I applaud the marketing department for not giving any of the secrets away in the trailers. Most alien films slowly reveal the aliens themselves, building suspense around what they look like (Signs, Alien, etc.). 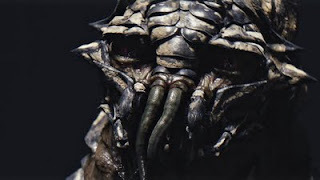 In District 9 you see dozens of aliens up close in the first five minutes. After all, they’ve been on Earth for twenty years already, so the secret is out. The Prawns look like the eight-foot offspring of grasshoppers and sea creatures. Emotionally, however, they’re a lot like we are. Some of them are kind to humans and others aren’t. It seems simple, but it’s amazing just how many alien films treat extra-terrestrials as though they all have the exact same agenda, if not the exact same brain. Of course they would be individuals with unique motives. 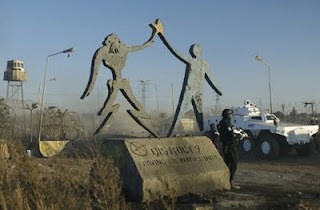 District 9 respects its characters, human and alien alike. The film deserves the Academy Award for Best Visual Effects for its seamless integration of grainy footage and cutting-edge imagery. Every time the camera shakes or the image blurs, the CG effects adapt accordingly, giving the impression that they were actually captured by some documentarian with a camcorder. The Prawns are realized through a combination of puppetry and CG, and they look fantastic on the big screen. It’s a wonderfully believable and immersive experience. It’s worth pointing out that District 9, while a first-rate film, isn’t a particularly enjoyable experience depending on your tolerance for violence. There’s a good deal of bloody mayhem, as the alien weapons cause humans to explode from within (think of dynamite in a watermelon). There’s also a character who undergoes a rather gross physical transformation, including teeth and finger nails that fall off. It could definitely be nightmare material for young viewers, and may gross you out regardless of your age. The film does usually give fair warning before showing something icky, providing ample ‘look away’ time. The last half hour has some video game-ish, shoot-em-up violence that feels a little out of place, but all in all, District 9 marches into new territory and tames it brilliantly. Sci-fi fans will appreciate this creative film, and as good word of mouth spreads, I predict more and more casual viewers will fall for it as well. Neill Blomkomp leaves the door wide open for a sequel or even two sequels, but still provides enough closure for the film to stand alone. Personally, I hope to see some more. If Blomkomp can maintain the same level of quality storytelling, bring on District 10. MPAA Rating: Rated R for bloody violence and pervasive language. The violence in District 9 would give a lot of sleepless nights to a lot of children (see the review’s next to last paragraph for specifics), and even some teens would be bothered by it. Strong language pops up throughout.